F-19: The Most Secret Aircraft Ever? 1. Since 1962, fighter planes have been designated by consecutive numbers, beginning with the F-1 Fury. F-13 was never assigned due to superstition. After the F/A-18, the next announced aircraft was the F-20. 2. The venerable Jane's All the World's Aircraft listed a Lockheed RF-19 in a 1987 reference book—"erroneously." 3. There's an F-19A Ghostrider in Tom Clancy's 1986 novel Red Storm Rising. Here are some additional "facts" and "photos" culled from the Internet. Yeah, the rest of the refueling photo looks grainier than the alleged F-19, but maybe that's because the F-19's made of a classified supermaterial. Next up, supposed Northrop catalog copy from the mid-’80s. 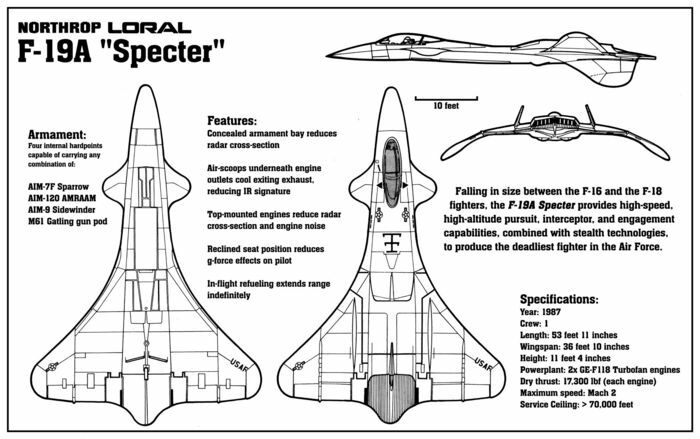 Did Northrop used to sell classified fighters by catalog? Let's go with it. There's also this ad Northrop supposedly had to pull in order to preserve the secret. Hit me with your evidence. In the meantime, in conclusion, the F-19 would be cool. And if the government's managed to keep it secret: cooler.